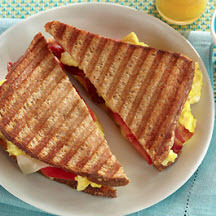 CooksRecipes has quality, kitchen-tested recipes for breakfast sandwiches, burritos and more that you can count on for successful deliciousness. 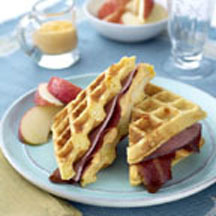 Waffle-wiches are a savory twist on a basic waffle, featuring an easy cheese sauce, ham and bacon. 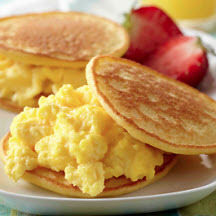 These tasty mini breakfast sandwiches are great way to add protein and choline to your family's diet. Pork Chop & Waffle Sandwiches with Maple "Gravy"